What Happens To Pot Convictions If Illinois Legalizes? A picture of the panel at News & Brews: Legalize It? The push to legalize recreational marijuana in Illinois could get a jump-start early next year. State Sen. Heather Steans, a Chicago Democrat, said this week she plans to introduce legislation early next year to tax and regulate the use and sale of marijuana. Incoming Democratic governor J.B. Pritzker campaigned on a pro-legalization platform, and House Speaker Michael Madigan has expressed support for Pritzker’s plan. Democrats control both chambers of the state legislature. 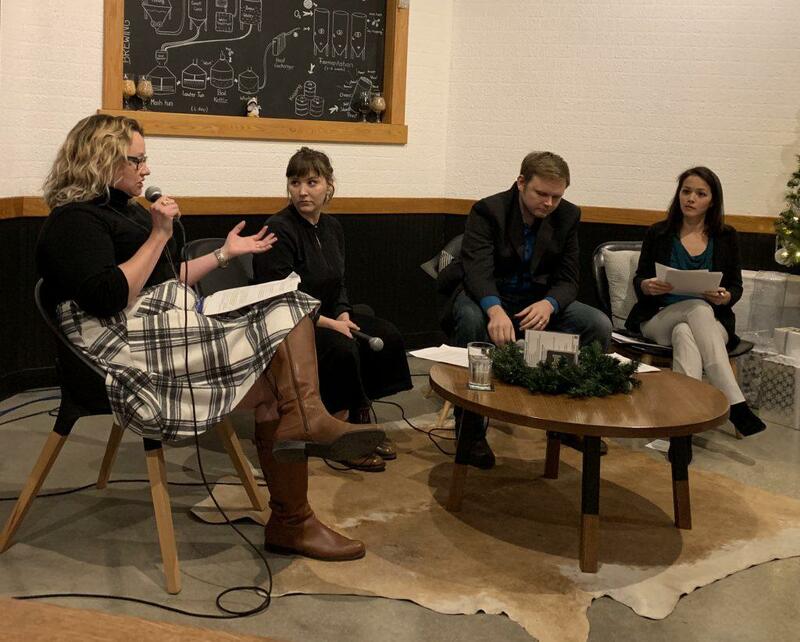 At a recent News and Brews community event about what legalization may mean for Illinois, Illinois Newsroom received more than 100 questions from our audience. Several attendees asked what will happen to those who are currently incarcerated on cannabis-related charges, as well as those who have felony records for pot convictions. Illinois Newsroom put the question to Steans. Below is a transcript of our interview that’s been lightly edited for clarity. Illinois Newsroom: As someone who was a sponsor of the original bill [to legalize recreational marijuana], are you going to be continuing to advocate for this next year as well? Steans: We are doing a new draft [of the legislation], and we’ve been talking to all sorts of folks and getting lots of input from variety of interest groups. And I have a new draft that we will be putting forth sometime early in the new session. IN: OK, so the person who asked this question, and this is related to the criminal justice component of this, so they’re wondering if recreational marijuana becomes legal, they want to know what happens to the people who have already been negatively impacted by marijuana in the criminal justice system. Will they be released or their record be cleaned from any marijuana crimes? The reason I am reaching out to you is I’m wondering if anything that deals with either of those two components is going to be part of future legislation. Steans: The plan is we will be including it in the draft of the bill on both fronts. One, there’s not that many folks that are in [prison] just for cannabis possession, and we also want to [release those in prison and expunge records] for very small level dealing up to Class 4 felonies. And then we also want to make it as easy as possible to expunge past records for that as well. You know we’re not a unified court system in Illinois. Every county operates its own court. So, some do paper, and some do it where they might have it on an electronic record. So it’s going to be easier or harder to try to make it automatic expungement. But we want to make it as easy as possible. We’re working through details on how to try to accomplish that. But, yes, the plan is to expunge people who have these records from the past as well. And then the last thing I would say about it is you know in the current (medical) industry, if you have a background with cannabis possession you can’t work in the industry. We also want to change that. So for some reason, if they can’t get their record expunged, they can still get employed, if the employer wants to hire them, in [the] cannabis industry. IN: What’s the rationale for that? Steans: Because we’re going to allow people to expunge their records now that it’s legal. IN: That kind of gets in to what I think is, tangentially, related to this issue, which is that people of color are disproportionately impacted by the criminal justice system, and specifically marijuana arrests. Steans: You betcha. They’re over seven times more likely to have been arrested in Illinois if you’re African American. I mean it’s really been outrageous. IN: There have been movements in California and in Massachusetts, both those states passed legislation or started programs to involve people of color and also people from lower income backgrounds in the marijuana industry. Is that something that you would like to see in Illinois? Steans: Yes. We see this as a three-piece process. One of them is the expungement, and two is inclusion and enabling people of color with backgrounds to be included in the industry now going forward. We also want to ensure that anybody who is in the business has to have plans to do minority hiring. To the extent that we can do it, we want to encourage preference for minority-owned, women-owned and veteran-owned [cannabis businesses]. Then we also want to create new classes of licenses. You know right now we just have cultivation and dispensary [for medical marijuana], limited opportunities for people to get involved in the industry. We want to add additional license categories so that there’s more opportunities for people of color to get involved, and women and veterans. And then the third piece is we think some of the revenue [from marijuana taxes] should be going toward neighborhoods that have been disproportionately impacted by the War on Drugs. IN: So, that would be areas that are low income or predominantly African-American neighborhoods? Steans: High violence and [high] poverty. We’re looking at the best way of doing that. We’re looking at options for that right now. IN: And I know that in a lot of places that have passed recreational marijuana, there wasn’t always a criminal justice related component tied to that ballot referendum. Do you think it’s going to be a tough sell to include some of these criminal justice reforms and equity initiatives? Steans: I sure hope not, but we don’t know yet entirely. But, you know, the incoming administration has said that they care about that piece. So we’ll certainly be working with them on it. The Latino and Black Caucuses I’m hoping will want to work with us and make sure that we keep those pieces in there. Because I think it’ll be important. IN: Are there any grassroots groups or activist groups that you’re working with on the marijuana legislation, but I wonder specifically with regard to this criminal justice piece? Steans: Yeah, we’ve been working with you know all sorts of different kinds of community groups and special interest groups. I like to say, please anybody who wants to talk to us about the bill — Rep. Kelly Cassidy, my House compatriot in all of this — we want to sit down with any and everybody so we encourage them to reach out to talk about the bill. Illinois Newsroom is committed to hearing what you need to know about the marijuana legalization debate and delivering public media content right to your fingertips. Join our text newsletter on the topic by texting WATCH to 217-394-5765. Republican state Sen. Jason Barickman said he will co-sponsor a 2019 measure to legalize cannabis. A new report suggests Illinois state and local governments would take in a combined $525 million in new tax revenue if the state legalizes recreational marijuana. The sticking points for how to legalize recreational marijuana in Illinois are getting a lot less sticky.